A paralysed woman, who is “almost completely locked in,” has become the first person to use a fully implanted brain-computer interface at home in day-to-day life without constant doctor supervision. The doctors and engineers at UMC Utrecht installed a relatively simple brain implant called an electrocorticograph (ECoG). An ECoG is very similar to an EEG, only the electrical sensors are placed inside your skull against your brain, rather than externally on your scalp. Thus, the readings from an ECoG are a little sharper than an EEG, though no where near as clear or high-resolution as other techniques. 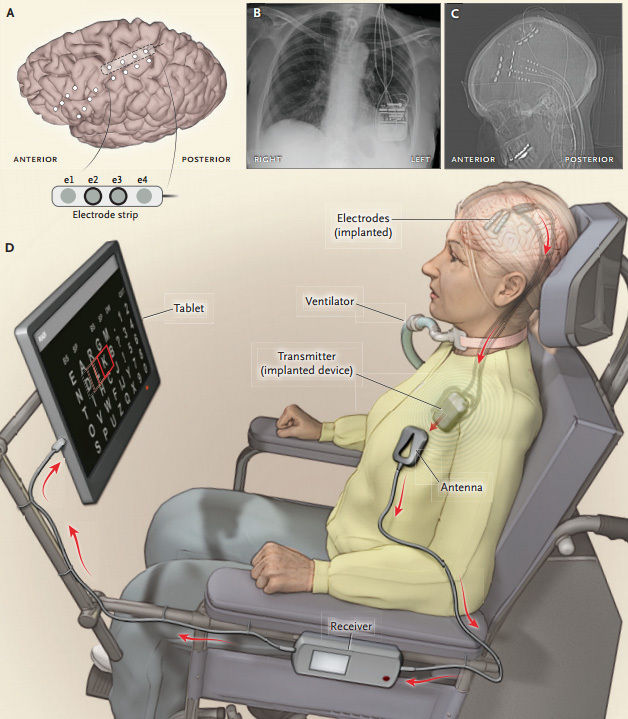 The most important thing in this case, though, is that the ECoG implant and computer interface are very small and lightweight, letting the patient use it at home or outside without supervision or support. The work was presented at the annual Society for Neuroscience meeting by Nick Ramsey, a specialist in brain-computer interfaces (BCI) at the Brain Center Rudolf Magnus at UMC Utrecht in the Netherlands. The research paper is published this month in the New England Journal of Medicine.